Just sent of a package for another TAG gifting event! This time, The Artisan Group is gifting the wardrobe stylist of CW's show 'Arrow' for possible use of our pieces on the show. 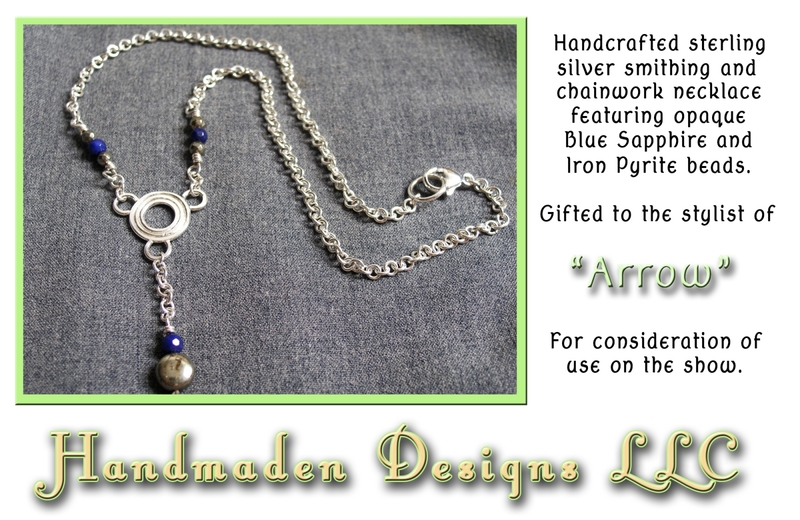 For this one, I made a sterling silver, smithing and chainwork necklace with Iron Pyrite and opaque Blue Sapphire beads. The necklace measures at about 16.25 inches long. Hey all! Watch vlogger MrsLolaLynn on Youtube to see her open her TAG swag bag!! The members of The Artisan Group (including yours truly) recently gifted her a bag full of handmade goodies. Watch the video to see her unveil these earrings and other great pieces!